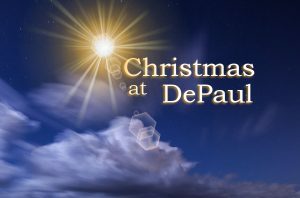 Christmas at DePaul – Volunteers Needed! Duties include moving and sorting donations, as well as greeting guests as they arrive for each performance. Christmas at DePaul has become a favorite holiday tradition for both our parish and the University community. As always, we are in need of volunteers to make sure the event runs smoothly. Duties include moving and sorting donations, as well as greeting guests as they arrive for each performance. We have three shifts available and volunteers are welcome to help at one or all three!